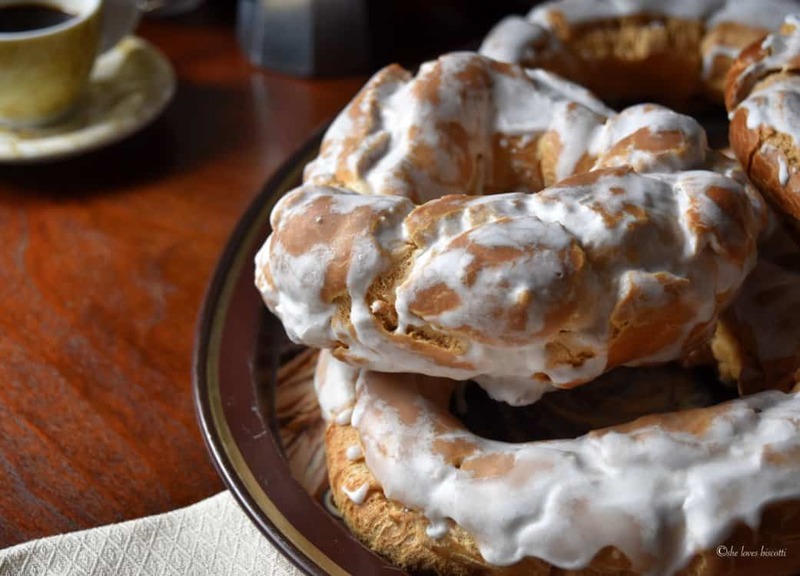 This recipe for the Best Homemade Italian Easter Egg Taralli di Filomena will leave you speechless. These featherlike taralli provide the perfect balance between crunchiness and chewiness. A short while ago, I shared a picture of the egg taralli that were made by la signora Filomena, my friend’s mom. There were so many of you that wrote to me requesting the recipe. In the span of a few weeks, I tried the recipe three times, trying to get it right. 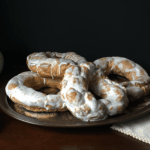 I am finally ready to share this recipe for these taralli cookies with all of you and more importantly, la signora Filomena’s advice when making them. For those of you visiting for the first time, you need to know that I have a taralli obsession. A while back, I posted my mom’s Glazed Italian Egg Taralli. My mom would always make these around Easter and throughout the year because we loved them that much. I have tried to reproduce her recipe -it’s good, but I am curious to see the results if I apply la signora Filomena’s tips. With that being said, my to do list just got longer… I will remake my mom’s egg taralli recipe with la signora Filomena’s advice. 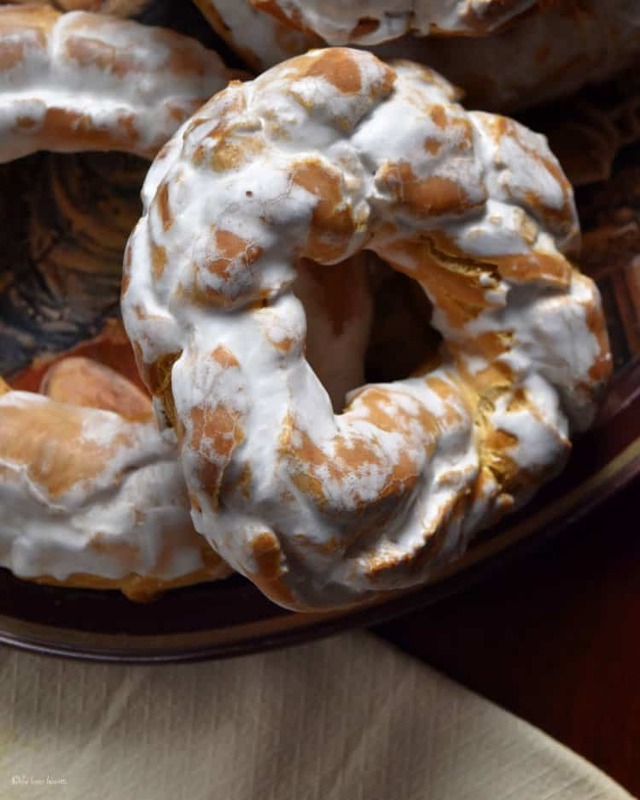 But for now, here is the Best Homemade Italian Easter Egg Taralli di Filomena… are you ready? 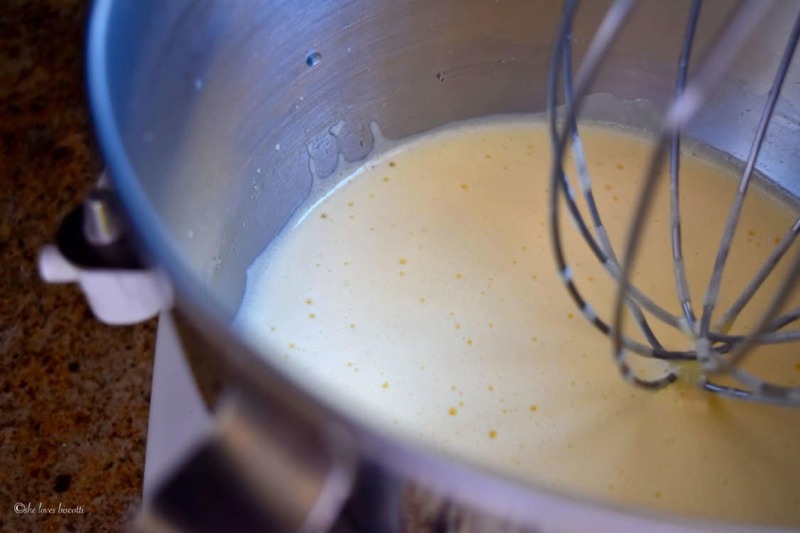 We will be using both the whisk and dough hook of the stand mixer to make this recipe. If you feel like getting a work out, feel free to knead the dough by hand. We will now whisk the room temperature eggs on medium-high speed for about 4-5 minutes. At this point add the sugar and the oil. Please note that there is only one tablespoon of sugar… this is not a typo. There really is just one. Have you noticed how so many traditional recipes will have the same quantity for the ingredients? 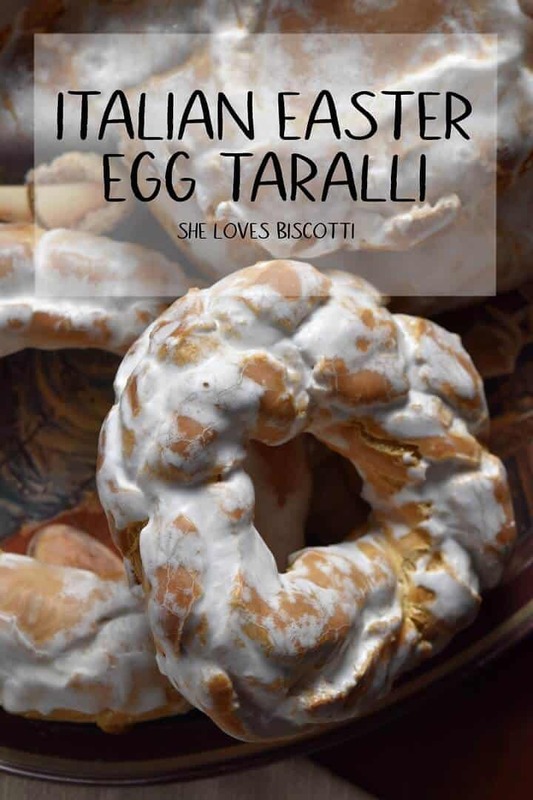 Take for example this recipe for the Best Homemade Italian Easter Egg Taralli di Filomena; 5 eggs; 5 tablespoons of oil, which will give you 5 taralli. Okay, so enough math 😉 At this point, I incorporate about one third of the flour and then switch over to the dough hook to incorporate the remainder of the flour. Let your stand mixer do all the work for about 10 minutes. 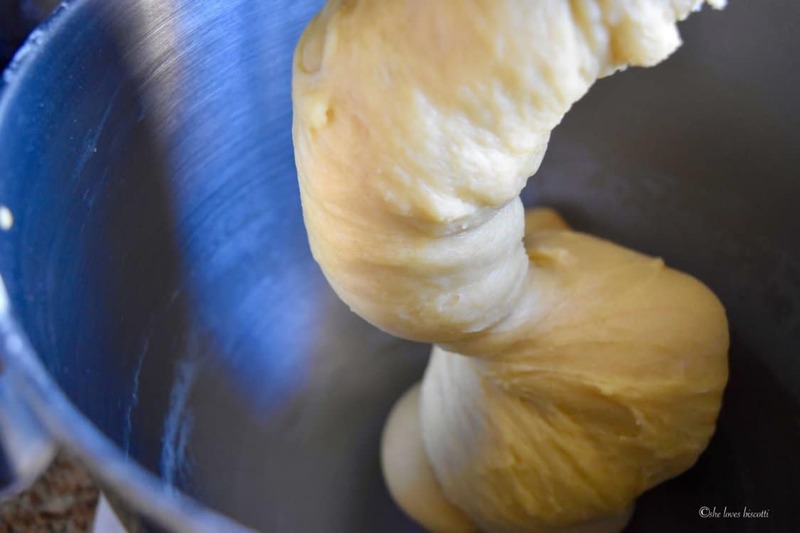 At the end of the kneading process, the dough should pull away from the sides of the bowl. Shape the dough into a log; wrap it in plastic wrap and let it rest for at least 30 minutes at room temperature (I will usually place a tea towel over the top). 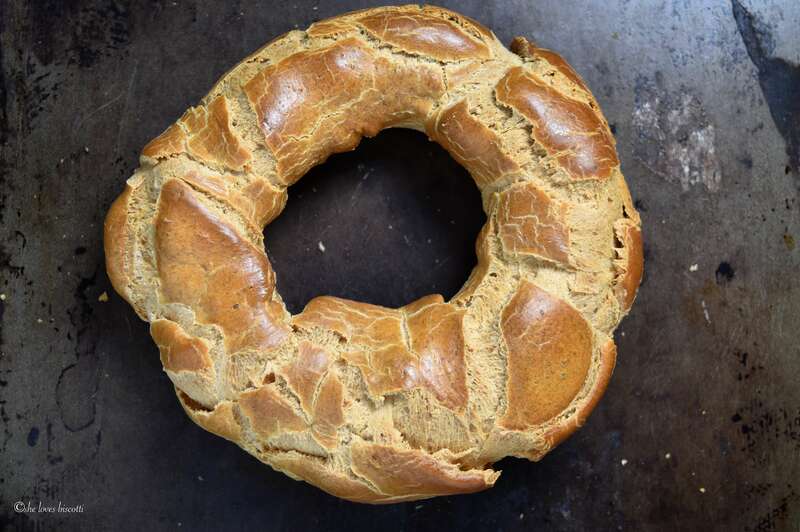 The longer it rests, the easier the taralli will be to shape. With thumb and forefinger, pinch the middle piece of the dough to create a hole. Slowly enlarge the hole, while forming a donut shape. Repeat until all 5 pieces of dough have been formed. 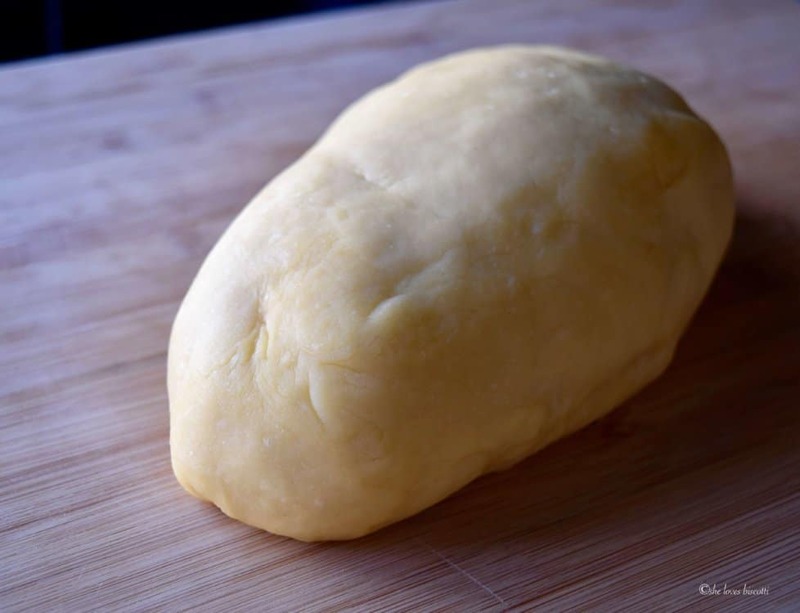 Be sure to keep the unshaped pieces of dough covered so that they do not dry out before you have a chance to shape them. Bring a large pot of water to a 200°F (essentially, really hot water with a couple of bubbles escaping to the surface). Place the taralli in the water and remove with a slotted spoon once they float to the top (about 3-4 minutes). Make sure the taralli do not stick to the bottom of the pot by gently moving it around. My pot will only accommodate one taralli, so it’s one taralli at a time for me. Place the boiled taralli on clean tea towel and repeat the process until all the taralli have been given a hot water bath. Turn them over so that they become completely dry. The boiled taralli will be placed directly on oven grates, which should be positioned in the middle of the oven. I was surprised to learn that unlike my mom’s recipe, la Signora Filomena does not slit her taralli. Bake in a preheated oven at 425° F (220° C) for about 5 minutes; then reduce to 400° F (200° C) for another 10 minutes; reduce again to 375° F (190° C) for another 10 minutes and finally to 350° F (175° C) for another 10-15 minutes, until cracked, golden brown and light. If you find they are getting too dark, place a sheet of aluminum foil loosely over the top. If you prefer more chewy taralli, I would recommend a shorter amount of time, about 8 minutes at all intervals except the initial one. 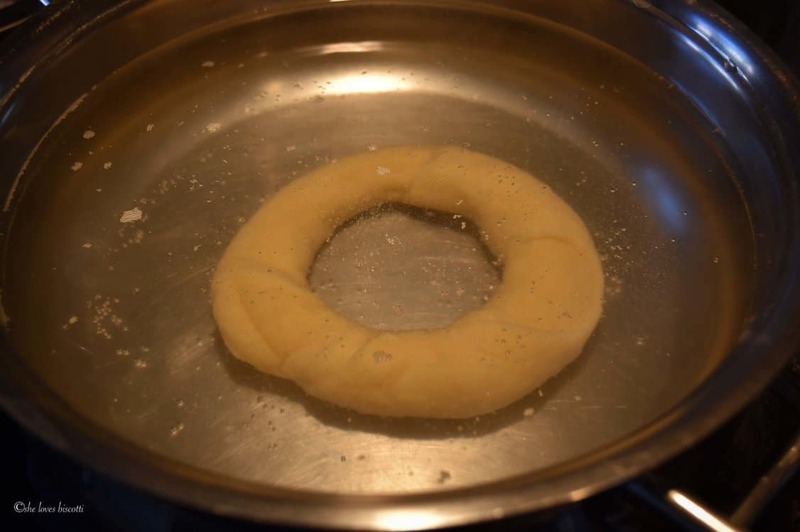 La signora Filomena told me that in order for the taralli to puff up, you must learn how to “control the oven temperature… that’s the secret”, she said. Well you and I both know that every oven is different. It took me three trial runs to get these taralli the way I wanted them to be. So, if at first you don’t succeed try and try again. 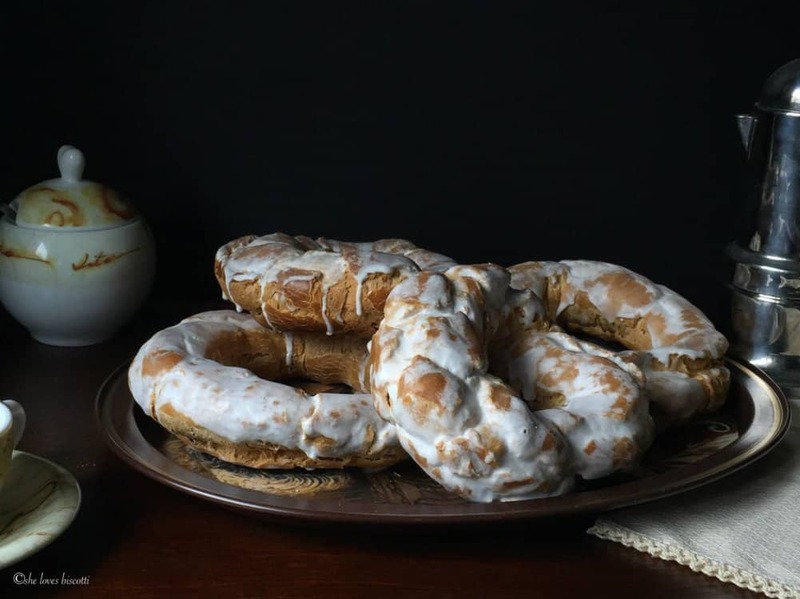 As far as the glaze is concerned, it is a simple combination of a few tablespoons of freshly squeezed lemon juice and confectioners sugar… we are basically looking for a spreadable glaze. I used my mom’s recipe for the glaze. Once the glaze hardens, it becomes glossy. 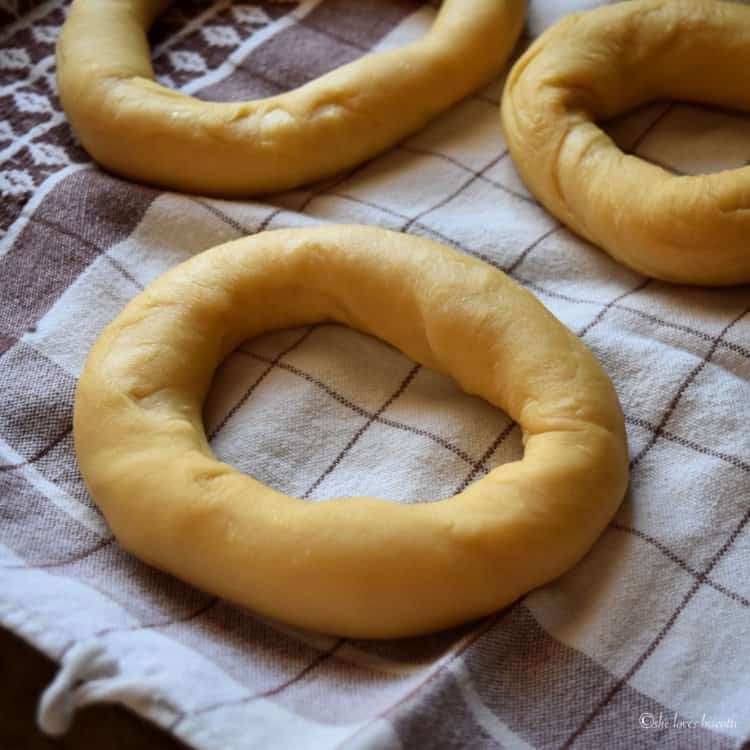 The Best Homemade Italian Easter Egg Taralli di Filomena can be stored at room temperature, lightly covered with wax paper for a couple of weeks. 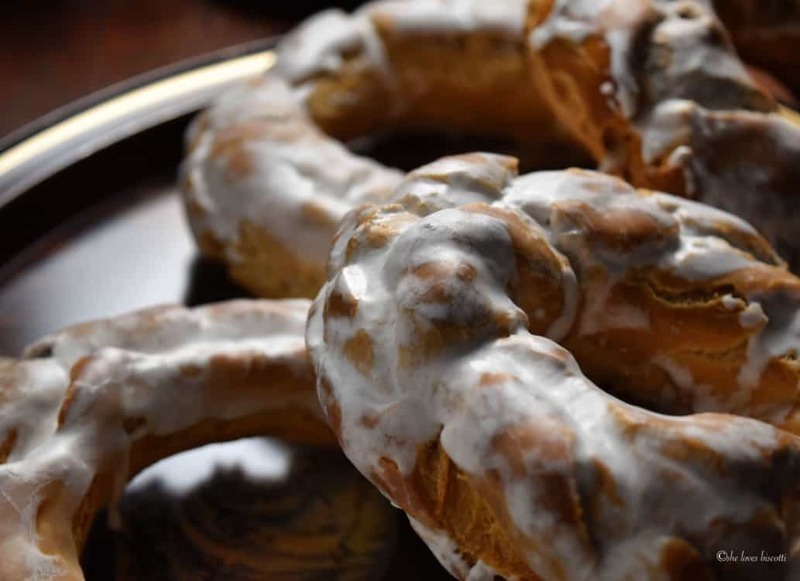 If you do decide to give the Best Homemade Italian Easter Egg Taralli di Filomena a try, I would love to hear about it. I will keep you informed on the outcome of these tips and tricks on my mom’s egg taralli recipe. Wishing you all a great baking week! 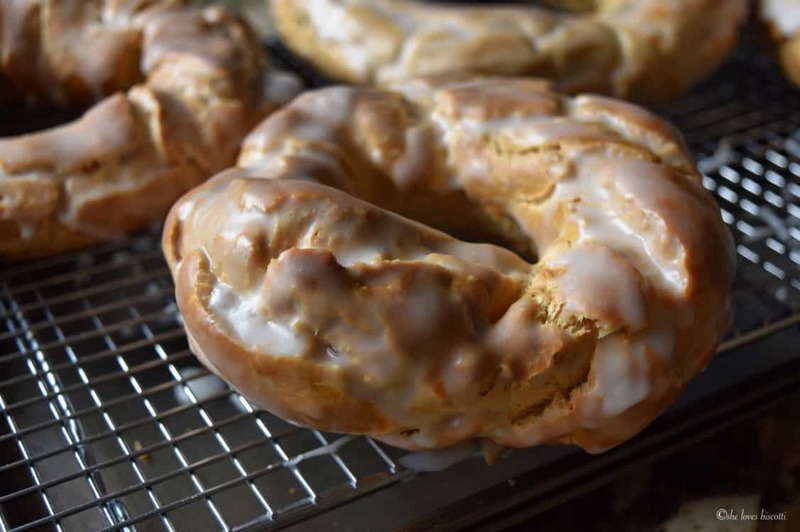 ★★★★★ If you have made this Italian Easter Egg Taralli recipe, I would love to hear about it in the comments below and be sure to rate the recipe! 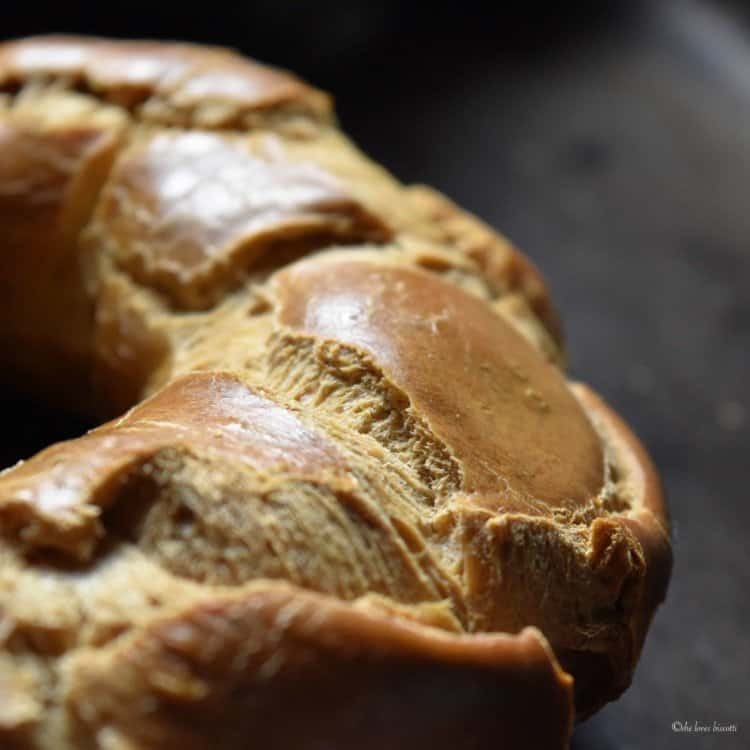 The Best Homemade Italian Easter Egg Taralli di Filomena will provide you with the perfect balance between crunchiness and chewiness. In a large mixing bowl, sift together flour and salt. Set aside. Add the sugar and the oil. 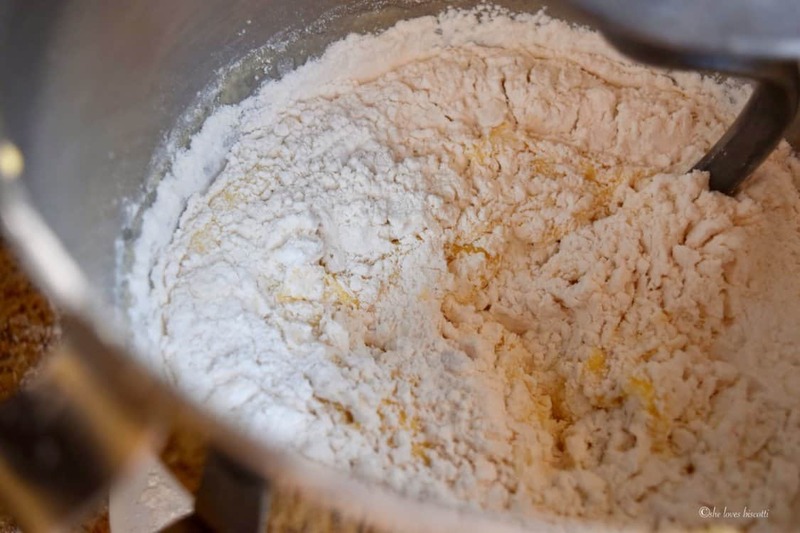 On low speed, add about ⅓ of the flour mixture. 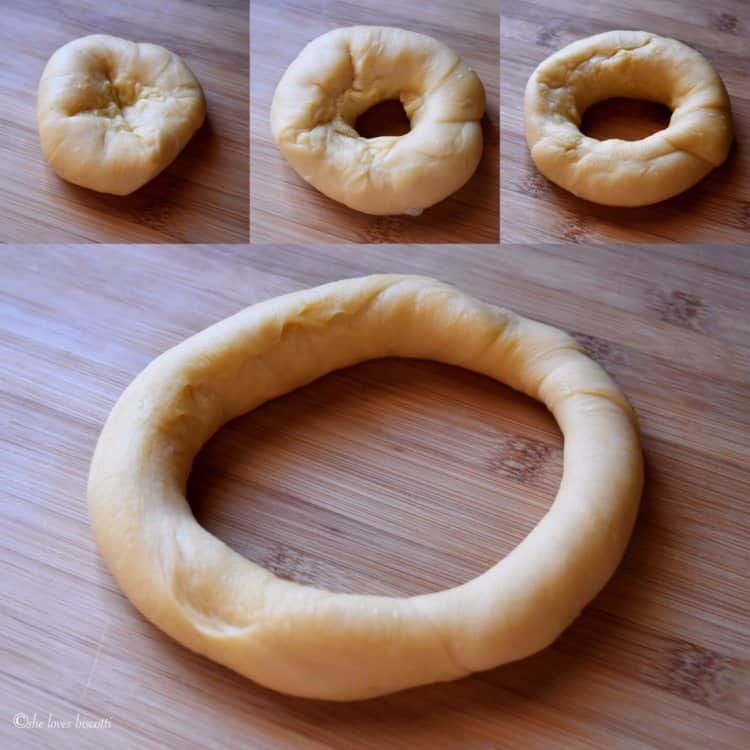 Cut dough into 5 pieces (work with one piece of dough at a time; keep the rest of the dough covered). Bring a large pot of water to a 200°F (what we want is really hot water with a couple of bubbles escaping from the surface). Place the taralli in the water and remove with slotted spoon once they rise to the top (about 3-4 minutes). Make sure they do no stick to the bottom of the pot. Place on clean tea towel. Bake in a preheated oven at 425° F (220° C) for 5 minutes; then reduce to 400° F (200° C) for another 10 minutes; reduce again to 375° F (190° C) for another 10 minutes and finally to 350° F (175° C) for another 10-15 minutes, until cracked, golden brown and light to the touch (set oven rack in the center). If you find they are getting too dark, place a sheet of aluminum foil loosely over the top. Remove from oven once golden colored. The glaze is the simple combination of a few tablespoons of freshly squeezed lemon juice and confectioners sugar. Whisk together and brush over taralli. DO YOU LOVE THIS ITALIAN EGG TARALLI RECIPE? PIN IT TO YOUR EASTER BOARD! Once boiled, I leave my taralli to dry out overnight and then bake. That is very interesting Faye, thanks so much for sharing. I can see how that would contribute to a lighter tasting taralli. I must try this… thanks again! This really is such an amazing recipe, I am sure you are going to love these Rina! I am so glad I didn’t give up on it. This looks so good that I nearly shed a tear!!! I had never heard of these before. They look amazing! I’m adding them to my “my try” list! I was not at all familiar with this particular type of Taralli for Easter; the egg must make it so rich and tasty. What is the texture light once you break it? It reminds me of a savory type of bread I have had in Modena. This is my type of recipe Maria, thank you for bringing to your readers. Your enthusiasm is infectious Maria. Although I’ve never made taralli before (I know…how come? )…I’m certainly going to have to make these at some point. Thanks for Filomena’s dedicated pointers…especially about the oven. Flavourful wishes and Buona Pasqua. Yum! These look delicious. Thanks for sharing. Again thank you for this recipe. The egg taralli were a staple esp for easter when I was growing up although without the glaze. Sometimes they would be make more savoury with pepper. I can’t wait to make them. Each holiday I am thankful for the traditional recipes that you take the time to test. Looks AMAZING! Just wishing I had a stand mixer to do this!! Enjoy Easter! Looks lovely. Perfect for the holidays.